In what can be termed as acute embarrassment to major media houses, a “Modi”fication of articles that were published, based on GDP of Gujarat state was done hurriedly. Today Business Standard, one of India’s leading newspaper, carried an article by AK Bhattacharya, with a set of figures that depict growth in Gujarat, trying to drive home a point that ‘growth of Gujarat is a myth’. Soon, other media houses like Rediff, and surprisingly the British Broadcasting Corporation joined the bandwagon. this resulted in print media splashing articles quoting the figures quoted by Business Standard. BBC even went to the extent of nailing Gujarat with a story titled “Is Gujarat’s Red Hot Economy a Myth?” But soon followed counter figures, with accurate proof, which put the very same media houses to shame. The article published byBusiness Standard quotes the GDP of Gujarat as 6.3%, where as the actual figures stood at a towering 10.08%. The credit of exposing the leading media houses and their credibility goes to Vijay (@centerofright) who exposed the mammoth difference between the real figures and what was contorted and published. With the real facts presented before them,Business Standard was forced to edit their original article and issue a clarification that read thus: This column has been modified to incorporate corrected data. (Read the article here). The step taken by Business Standard of publishing the original article without conforming to real data and their subsequent correction led to an outright flurry over Twitter, the micro-blogging site. There were rampant discussions that questioned the credibility of leading media houses and the news they present the common man with. Even the reliability and integrity of BBC stood at stake. A shamefaced BBC had to change the title of their article to ‘Gujarat IS a Red Hot Economy’. “It is silly that reputed media houses made mistake in a topic like GDP of Gujarat when Growth of Gujarat is a heavily debated issue.” Many tweeple raised their concern. 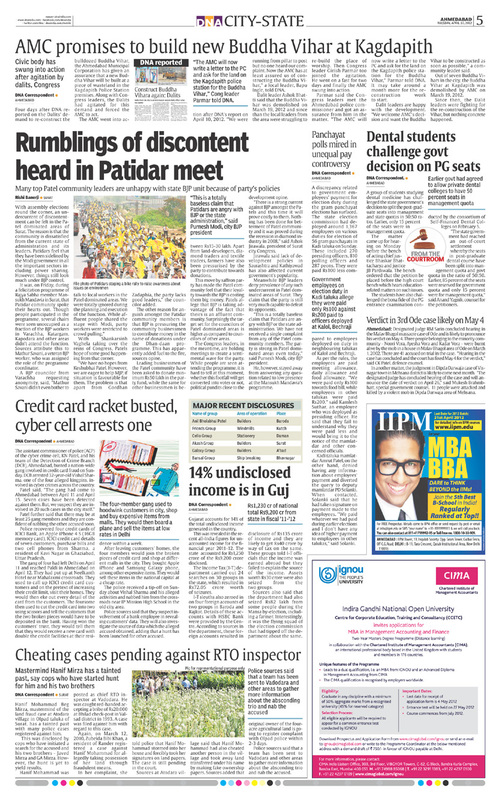 How Business Standard and BBC had to Retract a Story on Gujarat (read), Modi bashing!!! The original article in Business Standard by AK Bhattacharya. Then i had tweeted a bunch in the morning and left it at that and forgot about the same. 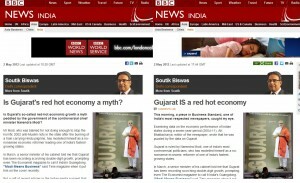 Then Soutik From BBC Came up with this Gem and a link to his BBC Article with a Headline – Is Gujarat Red Hot Economy a Myth? quoting the same Business Standard article. Read the full posting: How Business Standard and BBC had to Retract a Story on Gujarat. This was revealed in the recent all-India figures for unaccounted income for the financial year 2011-12. The state accounted for Rs1,250 crore of the Rs9,200 crore disclosed. The Income Tax (I-T) department carried out 24 searches on 30 groups in the state, which resulted in Rs72.05 crore worth of seizures. I-T sleuths also zeroed in on four foreign accounts of two groups in Baroda and Rajkot. Details of these accounts with HSBC Bank were provided by the Centre. According to sources in the department, these foreign accounts resulted in disclosure of Rs135 crore of income and they are likely to get Rs40 crore by way of tax on the same. These groups told I-T officials that the income was earned abroad but they failed to explain the source of the income. Assets worth Rs30 crore were also seized from the two groups.